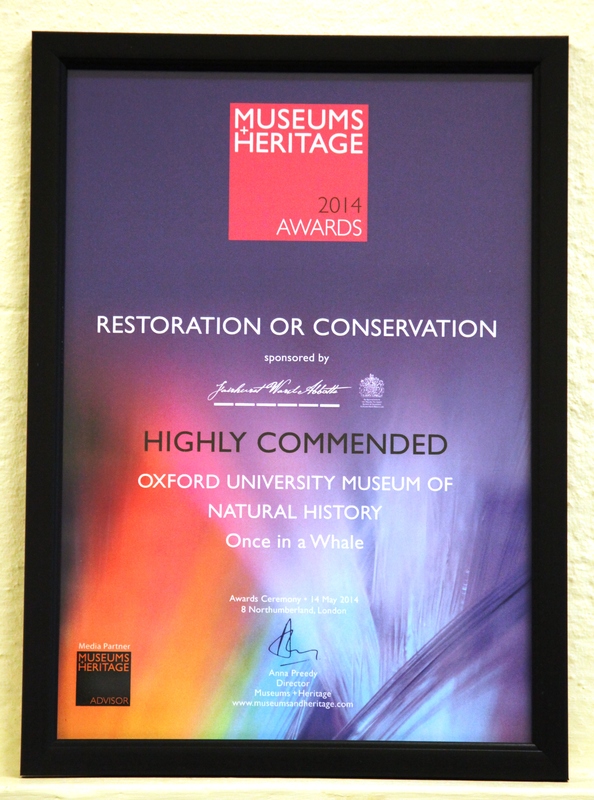 A quick update on the Museums and Heritage Awards, we didn’t win our category however the project was awarded ‘Highly Commended’ and we are so pleased with the result. We even received a certificate on the night! With just under 10,000 hits to date, we’d like to say a big thank you to everyone who has visited this blog in the past year, especially those who have shared advice, support and encouragement from across the globe. Thank you! Thank you Robert for putting this together for us! You can watch it on a loop in the museum if you can’t get enough. These stunning film stills were taken in collaboration with artist and film-maker Jessica Rinland who joined us in the Whale Aisle to document the ‘Once in a Whale’ project. Jessica graduated in Fine Art from Central Saint Martins, London, and approached us to gather material for her work, which has an ongoing theme of whale biology and their impact on her as an artist. The nature of Jessica’s analogue work (see the stills below) is something we were really excited to be involved in, it’s wonderful as conservators to see the preservation of traditional methods of film-making. ‘I like the discipline of having one roll of 100ft and having to pay attention to what is going on around me, choosing moments, rather than continuous shooting. And the delay from shooting to watching back the footage allows me time to evaluate my memory of the moment before seeing what I captured. We wish to thank Jessica Rinland for involving us in her work, and we will look forward to sharing her film with you. Also, if you’re interested in seeing Jessica’s work, there is an event at the London Review Bookshop on February 12th 2014. This week, the ‘whale aisle’ was invaded by a hoard of riggers and scaffolders, constructing a safe and simple means to transfer the specimens into their new positions in the gallery. Not moving too far, the specimens are now in size order and are staggered, taking advantage of the vast roof space. The Northern Bottlenose Whale is now at the highest level (7 meters up!) and the Dolphin at the lowest. This new positioning meant transporting the Orca, Beluga and Dolphin out of the aisle on wheels, and then returning them to their new locations, ready to be hoisted. As a parting gift we made each specimen an engraved acrylic sign. This included updated taxonomic information and a contemporary, larger font to keep with the museum’s new visual identity. To further engage visitors, we provided all information on both sides of the panel. We also used this opportunity to take photomicrographs of the bone and cartilage for our records. Due to the movement and handling of the specimens, a few final adjustments were needed once the whales were settled into their desired positions. A big thank you to Outback Rigging, Alan & Foxworthy Scaffolding Services and Beard Construction for their help with this memorable event. We look forward to sharing more photos with you next week to see the pod in their new home. Although the conservation of our whale specimens has drawn to a close, there’s still a hub of activity in the ‘whale aisle’. This week, we had an opportunity to finally uncover the Sperm Whale mandible as it was featured in a new BBC Nature Series, ‘Secrets of Bones’. To see the specimen for the first time, under natural light without the shelter of scaffolding was a real delight. The conservation team was eager to oversee the action and learn about the process of putting a documentary together. Ben Garrod, evolutionary biologist, used the museum specimens to look at the evolution of the mandible and its diversity in nature. The beautiful Sperm Whale jaw is an excellent example of this. The series will be televised in February 2014, and we’re excited to see if we made it on-screen! The re-installation of the remaining skeletons is expected to happen in 2 weeks and we will be sure to blog the experience. 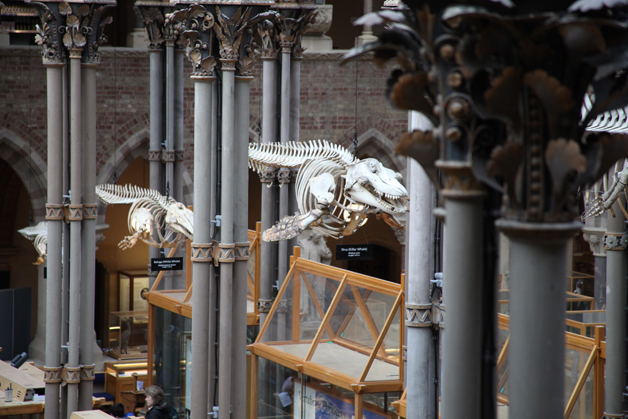 Over the last couple of weeks our conservation team has been involved in the popular ‘Making Museums’ school project hosted between the Pitt Rivers Museum and Oxford University Museum of Natural History. 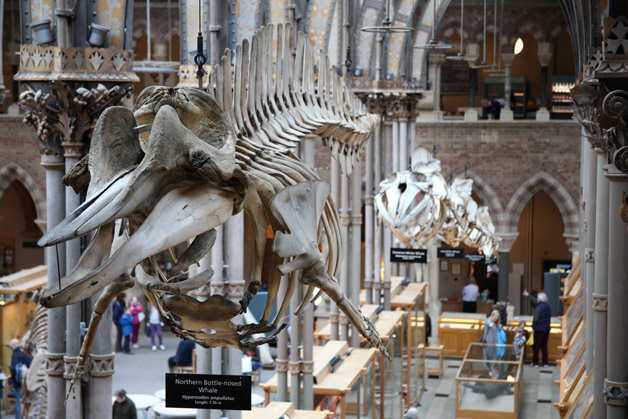 Bethany, Nicola and I took turns to lead behind-the-scenes tours of our ‘whale aisle’, during which 10-11 year old pupils from East Oxford primary schools were introduced to ‘conservation’ as a wonderful museum profession. 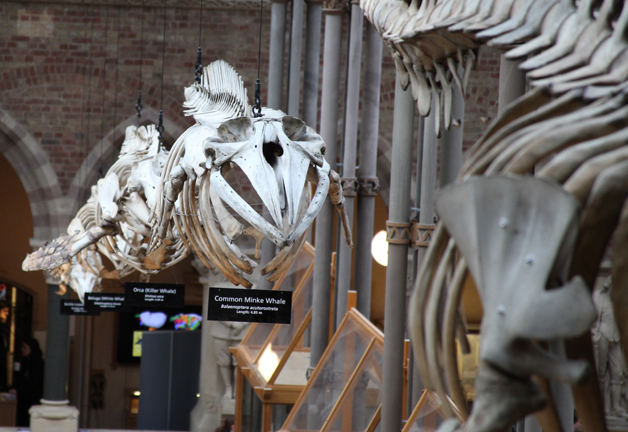 Pupils learned about the importance of specimens to the museum and scientists, what affected the condition of the skeletons, how we conserved the whales, how and why whale anatomy differs between species and about what talents and special interests conservators bring to the profession. We loved seeing their eyes widen at the size of our enormous Sperm Whale mandible, their disgust at handling a ball of tar-like degraded whale oil, their bewilderment at the fact whales have floating pelvises, and their bemusement at whales having ‘hand’ bones. At the end of the tours, the pupils were thrilled to have joined the privileged ‘VIP club’ (as termed by a pupil) of lucky people who have seen the whale skeletons up close. We may have even planted a few seeds in some young minds about a potential career in conservation. Only two weeks until project completion- watch this space! In this blog entry we give you a sneak preview showcasing atmospheric film stills taken while documenting conservation work on the whales by freelance film maker Robert Rapoport. Robert is completing a PhD at Oxford University (Ruskin School of Drawing and Fine Art) focusing on film theory. Inspired by our blog, he contacted us with the prospect of producing a short film, highlighting the ‘poetic fusing of craft and science’ that takes place during conservation. We wish to thank Robert Rapoport for kindly sharing his time, expertise, vision and images with us! Malcolm Boyden’s interview with Bethany lasts 14 minutes- select ‘1:06min’ to listen in on their chat about the whales, the museum renovation, Bethany’s experiences of being a conservator and more! As we enter into the last 5 weeks on the whale conservation project, we are pressing ahead with re-articulating the skeletons with new screw fixings and stainless steel wire (- our hands end up looking like we had a fight with a sharp clawed cat). We’ve also been meeting with professional riggers, who once the main scaffolding has been de-assembled, will raise the cetacean skeletons into their NEW positions- watch this space! Our next blog entry may give you a sneak preview showcasing atmospheric film stills taken while documenting conservation work on the whales by freelance film maker Robert Rapoport.